What Problems do Employee Discount Programs Solve? We've been talking about employee discount programs a lot lately. Surprise! That's what Access Perks is. We put together an eBook outlining everything you need to know about these programs. We share how to put these programs together, how to evaluate vendors, what success looks like, and all that good stuff. Even with all that information, you still may be thinking, "Why do I care about employee discount programs?" Well, let's talk about slaying dragons for a second. You got dragons in your office? Hope not. They're large, foul-tempered, and have a tendency to burn things. If you did have a dragon problem, you'd want something or someone to come in and take care of it. In business, we spend money to solve problems. Even when we're buying something to "add value," there's a reason we're looking to add value. Employee discount programs are no different. What dragons are they slaying? This is really the big one. People need more money, yet they continue to take home less and less. It’s no surprise that money is a primary source of stress for most folks. You can pay them more, which you’re probably trying to do. Another option is to help them stretch their paychecks farther. As a result, companies are leaning into employee financial wellness. While most of this has focused on areas like retirement planning and personal finance education, many organizations have figured out that just helping employees save on everyday purchases can make a big difference. Ask most employees why they go to work and you’ll hear about paychecks and insurance. They're not volunteers, and they'll leave if their compensation goes away. Even engaged, happy employees probably wouldn’t work if they didn’t have to. There are people who love their jobs and see the company’s goals as their own, regardless of compensation, then there’s everyone else. Competent employees who aren't actively sabotaging the company are still valuable. And the more positive interactions they have with the company, the more likely they’ll be to stay and take their work seriously long-term. How can you create a positive, valuable, everyday interaction with every employee, whether they’re at work or at home? Your best bet is your benefits and perks. Insurance and PTO can’t be used on an everyday, unlimited basis. Employee discount programs can. In fact, they require usage. The more employees use them, the more they save. A good program that's constantly adding new merchants and offers influences daily shopping habits, generating curiosity and excitement every time an employee logs in or opens their discount app. Over time, those positive engagements add up. Enough of them can make an employer very, very hard to walk away from. One note here: make sure your employee discount program promotes your brand. Helping employees save money is honorable, but you don’t want the credit going to the company operating the discount program. If it isn’t branded for your company, beware. 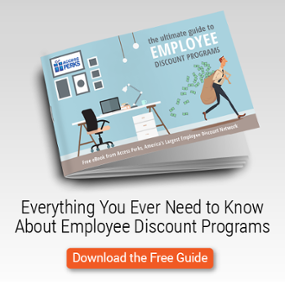 Employee discount programs aren’t just for employees. Some of them have powerful travel booking components that can save a company thousands of dollars, whether employees use the program or not. There’s more, though. A good program will come with deals on catering and supplies, gifts for employees, professional services, and more. Again, the more the company and employees use the program, the more valuable it becomes. If the program is worth its salt, you’ll offset the cost of the entire thing in just a few corporate travel bookings. The majority of an employee discount program’s value comes from the everyday spending. Think local restaurants, coffee shops, retailers, auto shops and so on. That’s the main course. But employee discount programs bring dessert, too. A good one can enable your employees to do things they might not otherwise do. Like book a family cruise across the Caribbean, or ride a zipline across a snowy canyon. These things matter. PTO - good, quality, uninterrupted PTO - has a positive impact on engagement and productivity. Even dinner and a movie become more palatable when employees can knock $30 off the total cost. The point is you’re helping employees live better lives and do more of the things they want to do. Savings matters to people - way more than you might think. As we’ve said a few times recently, employee benefits and perks are where your company can get creative and be totally different from competitors. A well-crafted perks menu will have a nice mix of hard and soft benefits - good insurance to go along with the ping pong table, for example. Employee discount programs can add value in many different ways. Corporate expenses and employee financial wellness are pretty big dragons, after all. A good one will have clear, measurable outcomes. Check out our free guide for descriptions of these measurables. It’s a clever, multi-faceted solution to a number of problems. Or at least, it’s going to contribute in clear ways toward slaying those dragons - something that can’t be said of many other benefits. Ready to learn more? Click the banner below to download our free guide right now.